TORONTO (Ticker) -- Andre Agassi almost made another early exit. Agassi dropped the the first set before rallying for a 4-6, 6-4, 6-4 victory over Germany's Tommy Haas on Monday in the first round of the $2.5 million Tennis Masters Series/Toronto. Winless this year, the 10th-seeded Agassi had lost his first match in three straight tournaments in Europe -- none of them on hard courts, his best surface. Among the no-names toppling the eight-time Grand Slam champion were Nenad Zimonjic and Jerome Haehnel. As the summer hardcourt season began two weeks ago, Agassi talked about leaving tennis on his own terms. He won his first two matches before losing to Haas, then withdrew from last week's event in Indianapolis before it began. 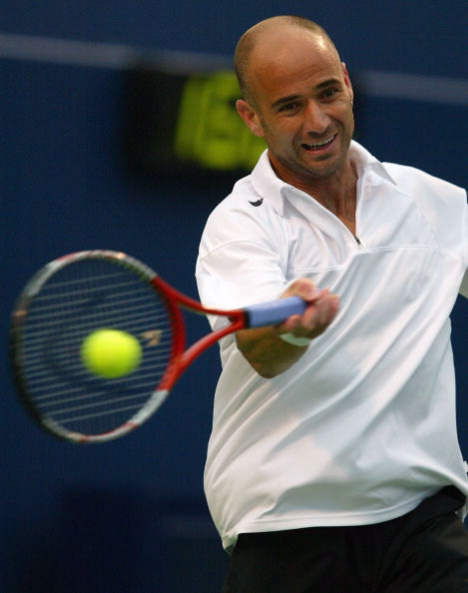 With a month to go before the U.S. Open, Agassi needed to get untracked. He nearly was looking for another practice partner after losing the first 10 points of the match but put his game together. Agassi is a three-time champion of this event, which is being held in the new $38 million Rexall Centre. "It's pretty special out there," Agassi said. "It's a great atmosphere. It feels like you're playing in the finals in the first round and that's a testament to the quality of stadium, the intimacy and the excitement of the crowd." Seventh seed Juan Carlos Ferrero of Spain made an early exit, bowing out just five games into his first-round match with France's Fabrice Santoro due to back pain. Since a loss in the final of the ABN AMRO Tournament, the 2003 French Open champion has dropped seven of 12 matches. A pair of seeds moved on, with No. 14 Paradorn Srichaphan of Thailand cruising past Andrei Pavel of Romania, 7-5, 6-2, and No. 16 Juan Ignacio Chela of Argentina defeating Xavier Malisse of Belgium, 6-3, 5-7, 6-3. Unseeded Canadian hopeful Daniel Nestor bowed out with a 6-3, 6-4 loss to lucky loser Cyril Saulnier of France, whose reward is a second-round match with No. 6 David Nalbandian of Argentina. Robin Soderling eliminated Thomas Enqvist, 7-6 (7-2), 6-3, in a battle of Swedes and draws top seed Roger Federer of Switzerland, who rested last week on his strong laurels. Federer is an astounding 47-4 this season, with the Australian Open and Wimbledon among his five titles. He seems to be the best candidate to challenge Andy Roddick's U.S. Open crown with a sterling 21-1 record on hard courts. The world's top-ranked player, Federer has won 17 straight matches since a third-round setback to Brazil's Gustavo Kuerten in the French Open. The two cannot meet until the final of this event. Kuerten kept up his end with a 6-1, 6-4 victory over American Robby Ginepri. The defending champion here, Roddick is seeded second and is mounting some momentum toward defense of his U.S. Open title. He claimed his fourth title of the year with Sunday's win in Indianapolis. Roddick will be looking to avenge a loss to Federer in the Wimbledon final. First, he must dispatch French qualifier Julien Benneteau.